Speaking at UMBC — DiResta Communication Inc. The University of Maryland Baltimore County invited me to give a keynote and workshop on How to Give a Knockout Presentation. Doctoral students, many of whom are underrepresented in STEM (Science, Technology, Engineering, and Mathematics), attended the PROMISE Summer Success Institute. I was honored to be invited to speak. The students were eager to learn and highly participative. Social media takes speaking to a new level. There was live tweeting during the panel and my keynote. It takes real confidence to keep speaking while the audience is twittering away. It was fun to read the comments. By the way, they found me on twitter, so I'm not complaining. 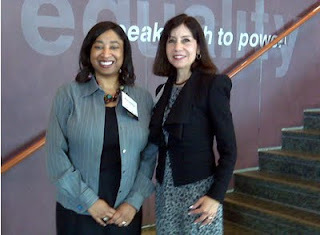 Here I am with Dr. Tull, who invited me to speak. Just as in business, the university has brilliant students who are not always brilliant presenters. The goal was to convey how to communicate with confidence and clarity especially when defending their dissertations and pitching ideas to their professors. We talked about the importance or reading the audience and code switching to accommodate a professor's supportive or confrontational style. Each student learned how to give a brief elevator speech and recognized the importance of personal rapport. Whether you're in school or the workplace relationships are the key to success. Newer PostWho Let the Dogs Out?